Just two days ago this blog warned of The Coming Civil Unions Ruse, where supporters of the amendment to limit the freedom to marry would start to tell voters that they can have their proverbial wedding cake and eat yours too. As Sunday’s Star Tribune Poll shows, even a majority of those planning to vote for the amendment believe in basic fairness for gay and lesbian couples and would support civil unions that would be “recognized as marriage in Minnesota.” I asked then if we would see the same pattern in Minnesota that other states have seen, where supporters of a constitutional amendment to limit the freedom to marry pretend to be for civil unions and then oppose legislative efforts to pass civil unions the second the balloting is over. So what’s the problem? 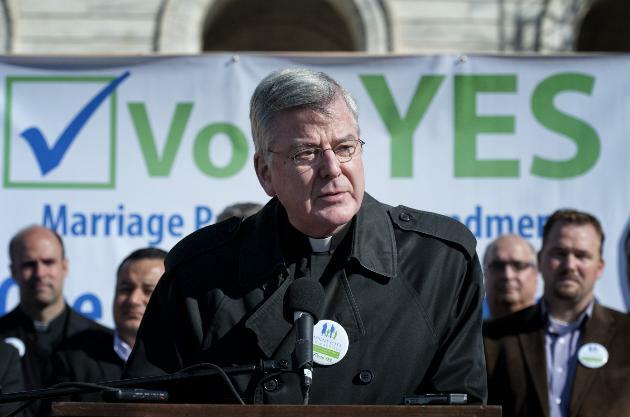 Darrell’s collecting a paycheck funded largely by the Catholic Church–indeed, one of the three lead stories in the Strib’s Morning Hot Dish political newsletter was Minnesota Catholics asked to pay for marriage vote TV ads. You have to wonder what His Grace thinks of Mr. Darrell’s seeming push for civil unions. Will he allow him to continue this ruse? I know the Charming Mr. Darrell assumes all Vote No supporters are godless heathens, but I do remember my Sunday School teacher calling that whole “do not bear false witness” thing not as recommendation, but a commandment. So, do you believe that, after spending all this money, His Grace will simply sit back and let civil unions happen? Keep Dreaming. Minnesotans, keep the conversations going. Do not believe the Civil Unions Ruse. This November, there is only one vote for fairness. And that vote is No. Who will be the first to ask the Archbishop why he is asking Catholics across the state to fund a campaign that is pushing the notion of civil unions, something the Church opposes just as vehemently as marriage? Any takers?